Many people putting @names at the beginning of their tweets realize these do not go into the Twitter “newsfeed”. For years many have been putting a dot in front of the @name at the front of a tweet like this: . @name to make sure that it did go into the feed. Just in case, you weren’t aware that tweets beginning with the @name will be filtered, it is important to know that the new Twitter redesign for 2014 is filtering them off the default of your Twitter profile entirely. The point of this is that Twitter expects that if you hit “reply” which automatically puts an @name at the beginning of a tweet and you leave it at the front of the tweet, you are in a conversation that the rest of us don’t need to hear. If you are in a Twitter Chat and include the hash tag, at least others in the chat will see it. If you have HashTracking doing a transcript, it will be there too. But it won’t be on the default of your Twitter profile. The “Tweets Only” view includes RT’s. To understand what I mean by that, please look at the Tweets Only view sample in the screen shot below. 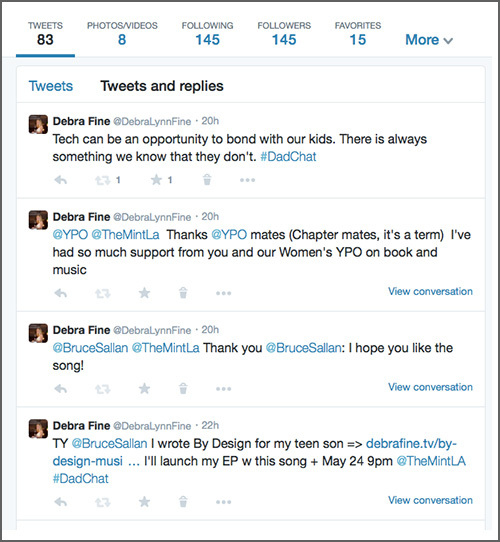 Debra has tweeted two retweets, one by Bruce Sallan and one by YPO. Both of these are displayed in the Tweets only view. Pinned Tweets only work in the “Tweets Only” default mode. Following are screen shots of the Tweets (only) view seen by default, and the Tweets and Replies view that the visitor has to choose. Tweets and Replies view that must be selected by the visitor to your Twitter profile to be seen. 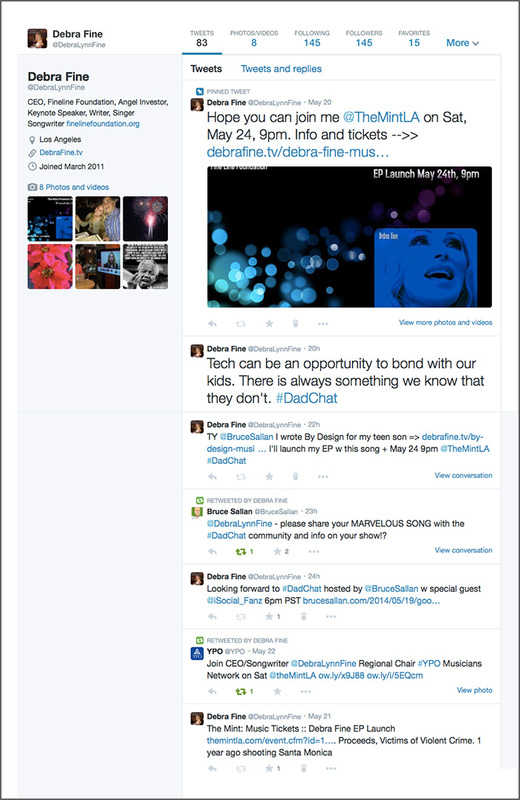 In case you are wondering, here is the song, By Design, written by Debra Fine, being discussed in the tweets. #DadChat is a Twitter Chat running each Thursday 9pm – 10pm ET, hosted by Bruce Sallan. I swear this whole thing confuses the heck outta me, Linda! You taught me from the beginning. If not for YOU, I’d not even be on Twitter NOR would I have EVER gone to a Tweet Chat – starting with #BlogChat – and nor would I ever had begun my own #DadChat – if YOU had not PUSHED ME. And “pushed” is the right word. What is that rumor that the whole hashtag thing was going away by Twitter? THAT made NO SENSE to me given how there’s world-wide hashtag mania but that was a bit scary after investing 3+ years in building my #DadChat community! Thank you BruceSallan. Well first you need convert to the new Twitter. You will need a 1500 x 500 header. You can never quit! I love being able to say you were my social media client for a year because the results speak for themselves. There is nothing better than clients who “do the work”. It’s a bit win-win for their coach. There is no way that Twitter is going to get rid of Twitter Chats. The discussion about hashtags going away is Twitter worrying about making Twitter simpler. Obviously, a lot of ordinary folk give up on Twitter rather quickly. And if the ordinary folk give up the marketing folks, celebrities and brands are just talking to each other.